Nothing says romance like fifteen cloves of garlic and gallons of olive oil! 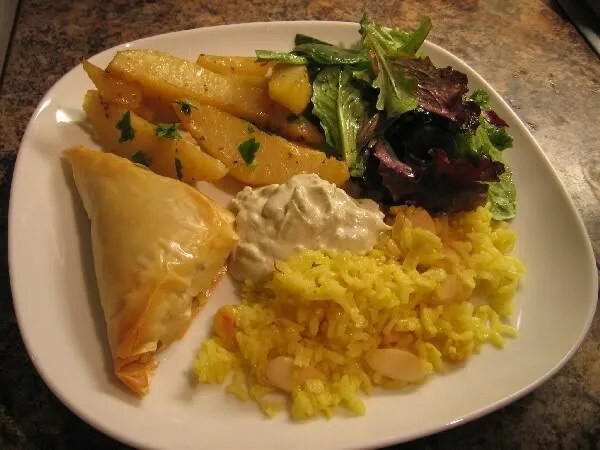 Spanakopita from Vegan With a Vengeance, Lemony Roasted Potatoes, Cashew Cucumber Dip, and Saffron Garlic Rice from Veganomicon, and salad. The potatoes are insanely good, and Mack and I couldn’t stop picking at the leftovers all night, as we watched the most random assortment of TV shows imaginable: part of an American Experience documentary on Ronald Reagan (made in 1998, so happily pre-bizarre-bipartisan-beatification), Jersey Shore, the works. I didn’t take a picture of the Chocolate Rum Pudding Cake from Vegan With a Vengeance, but it was delicious, too. I thought it would be nice to splurge, calorie-wise, and to make all dishes I had already made before. A word on the Pudding Cake: I made this years ago with an ancient springform pan, and it was problem-free and fantastic. Then that old pan finally bit the dust–its finish got degraded beyond repair and I had to throw it out. I tried the cake again about a year ago with a new pan, and the rum/boiling water layer spilled all over and was a nightmare. So I got a new pan for this try: a pretty little Wilton number. Alas, the same thing happened and about five minutes into baking I had to dump the whole mess into a pie plate and continue baking it that way. Since it’s pudding cake, it’s pretty forgiving, luckily. But what stress! Rum was dripping all over my oven and the floor, and I was swearing up and down. All’s well that ends well, I suppose. This is the last of my Christmas-related posts til next year! 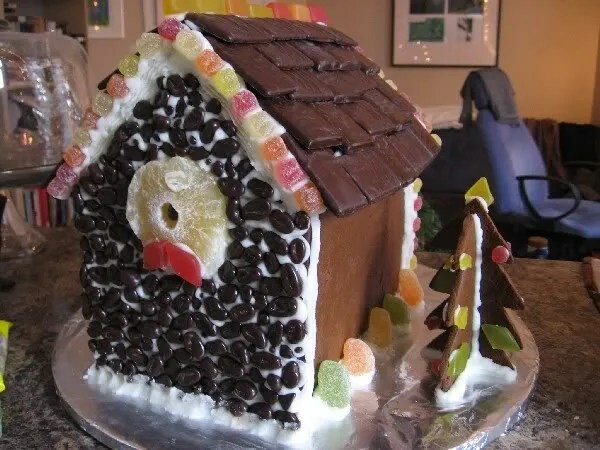 I had great fun making this house– I haven’t made a gingerbread house for probably fifteen years. And of course, this one was vegan! I visited Whole Foods while I was in Vancouver and got all sorts of vegan fancy versions of candy, and carried it home to Hamilton in my carry-on baggage. 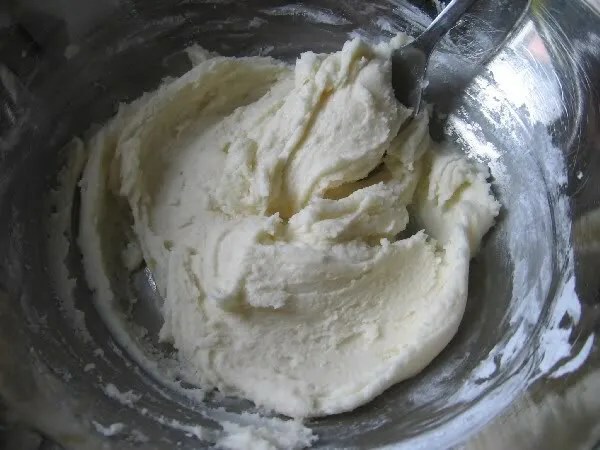 For the hard sauce, I just mixed some icing sugar and Earth Balance with some brandy, rum extract, and vanilla extract– like a very thick buttercream. 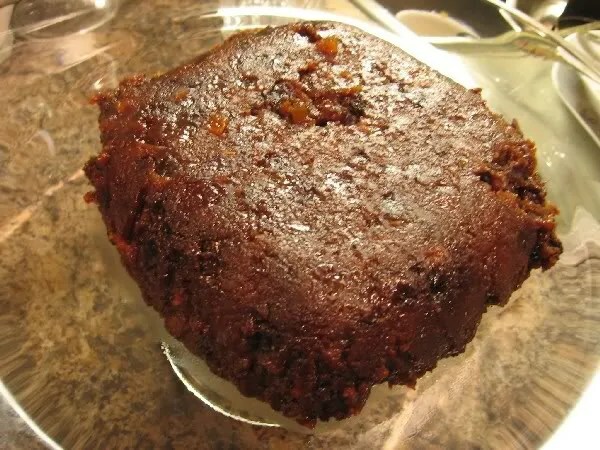 Christmas Plum Pudding– makes one pudding that fills about 2/3-3/4 of a 7 cup corningware. Several days before serving time, mix all ingredients together in a big bowl. If it’s super stiff, you can add a bit more brandy, but I didn’t have this problem. Now, the steaming. I used a large soup pot with a steaming basket in the bottom. Water is supposed to go halfway up your pudding container. Boil the water and then turn the heat down and simmer the whole shebang with the soup pot top on for five hours. Fill with more water when necessary– I only had to do it once or twice; having the thing covered keeps in the vast majority of the water. 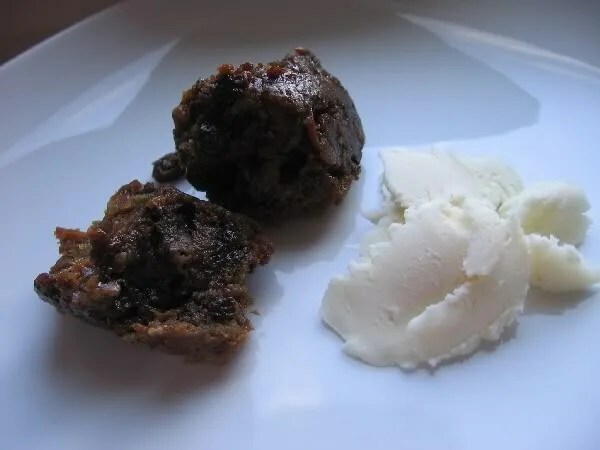 Cool the pudding and keep covered in the fridge, basting or “feeding” the pudding every one or two days with a bit of brandy. On serving day, you’ll want to heat up the pudding by the same steaming method you used to cook it, for about one to two hours. The way my Christmas day unfolded, I ended up steaming it for an hour or two during dinner prep, and then turning it off and leaving it in there while we watched a movie, and then turning the heat on again and steaming it some more, and it turned out great. 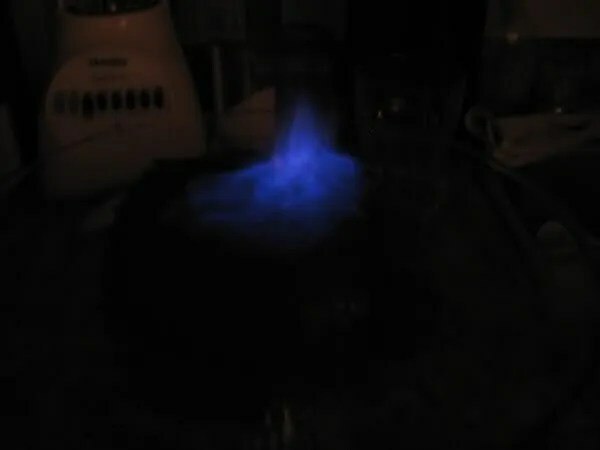 To flame the pudding, I just poured a little puddle of brandy over the inverted pudding and put a lit match to it. Instructions all over the internet say to hold a ladle of brandy over a lit candle until it alights, then to pour the lit brandy over the pudding, but this seemed unnecessarily tricky to me! This is the delicious hard sauce. A little goes a long way. The next day, cold. You are supposed to serve the cold hard sauce over the hot pudding so the sauce melts all over it, but it was just as enjoyable this way. My mom’s a great cook, but she’s never baked all that often. Exceptions: microwave brownies (remember those?? I don’t know where they went; they probably quietly decided that they are more hazardous than your average baked good or something), birthday cakes made from boxed mixes and decorated awesomely according to request (my favourite year was when she made me a sheet cake decorated to look like a map of the world! ), cookies from a mix, and apple crisp. 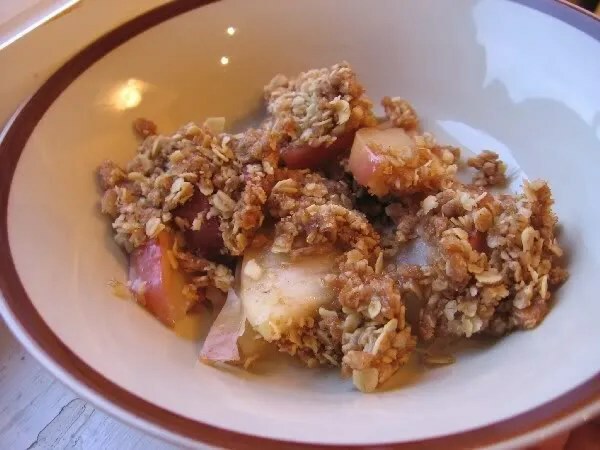 So at least several times a winter/fall, I try to recreate her apple crisp. The only real difference is that I tend to leave the peel on, and I use different margarine. But otherwise I’m transported back twenty years ago, to watching my amazing playwright mother throw this together, with a cigarette and the eighth cup of coffee of the day on the go. And the apartment would start to fill with the aroma of baking apples and I’d get so excited about apple crisp on the way! The crust was always the best part, and I’ve never quite been able to replicate how she makes it. 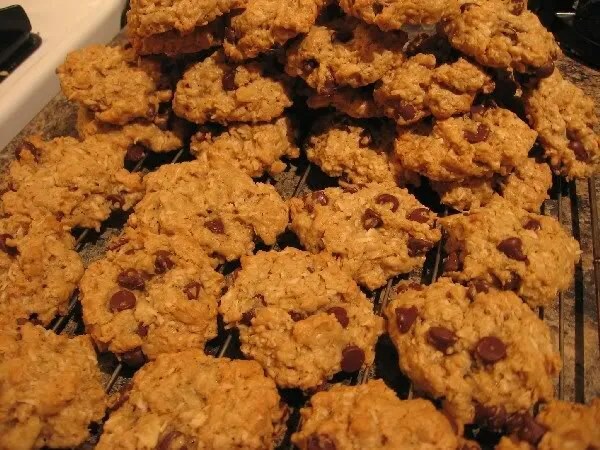 It’s just margarine, flour, brown sugar, and oats, and it’s best when it’s part crispy, part crumbly, and part soggy. Fantastic! Over the past few days, the relationship I’ve been carrying on with the large bag of chocolate chips I bought for the cake ganache has been, shall we say, unproductive and dysfunctional. Therapy worthy. I decided tonight that I needed to kick those chocolate chips to the curb. I know it’s debatable whether turning a given problem into cookies could ever be described as “kicking [said problem] to the curb.” But whatever, that’s what I did and I’m pleased, especially because 1) they are delicious and taste quite a bit like my Mooma’s oatmeal chocolate chip cookies, which I haven’t tasted in years; and 2) they used up some of the shredded coconut I’ve had kicking around my freezer for a long time. So, for Vegan MoFo Day 8, I offer a recommendation for Vegan Cookies Invade Your Cookie Jar‘s Cowboy Cookies. Ah, here’s what I was doing yesterday instead of updating! 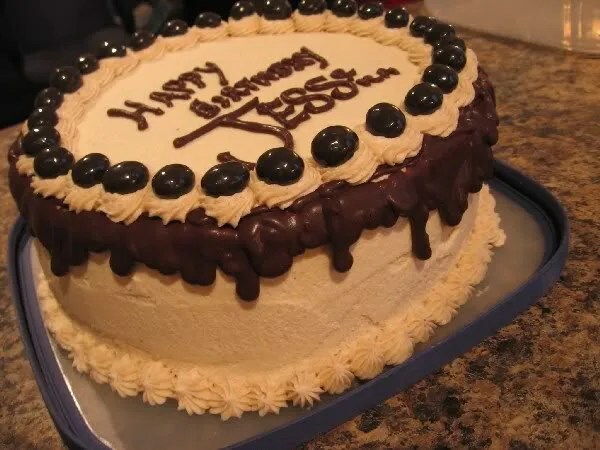 Four vanilla cake layers, soaked in rum/coffee syrup, filled and iced with an extremely temperamental whipped coconut/cashew cream, and trimmed with coffee buttercream, vegan chocolate covered coffee beans, and chocolate ganache. 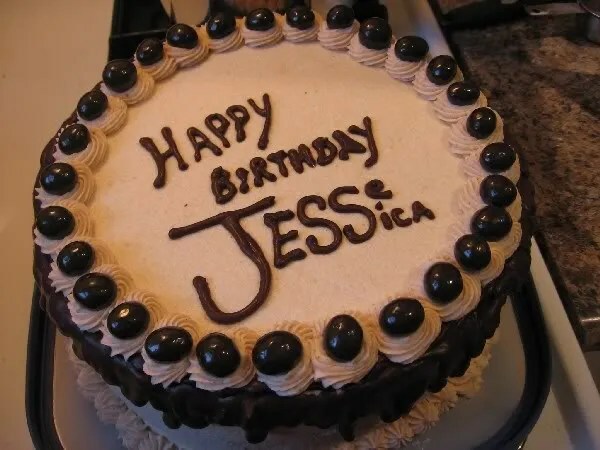 It was a cake to cover two birthdays– mine, last week, and Jesse’s, this week. Above, we have a picture of my method of syrup delivery. 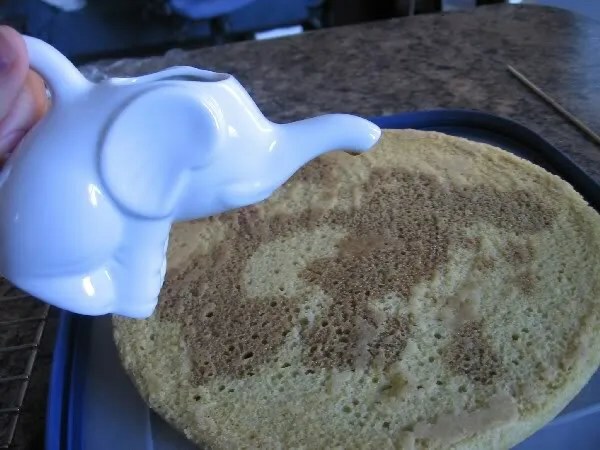 I didn’t want to go overboard, and the little elephant spout did the trick. However, I found upon cutting the cake that I had very little to worry about and the syrup hadn’t penetrated very far or very destructively. I wished I’d gone a little heavier on the syrup, but then you never know how that would have affected the cake’s integrity. The syrup was made of strong coffee, some dark rum, some agave and some icing sugar. 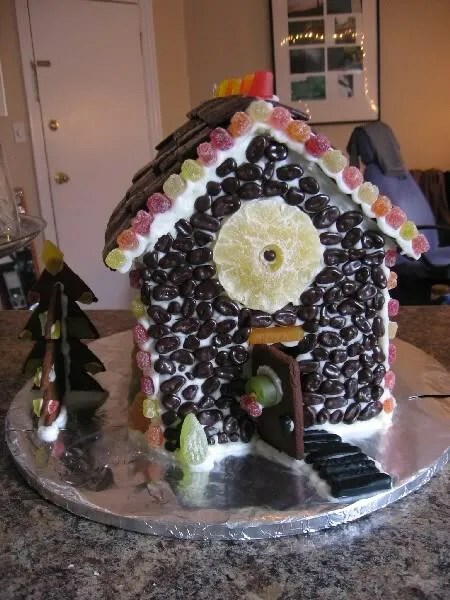 My apologies for not having better measurements– I tend to wing cake accoutrements and I do it in a bit of a non-recorded fly-by-the-seat-of-my-pants frenzy. Alright, here we have a better idea of the coconut/cashew whipped cream. On the top and sides it’s very smoothed out/patted down with my offset spatula, so you don’t get a sense of the consistency. I fought with this stuff for a whole evening and the following morning to make sure it didn’t separate too much. Started with soaked cashews blended with the chilled top contents of two cans of full-fat coconut milk, a bit of rum extract, some icing sugar, some “Whip-It” whipping cream stabilizer powder, then doctored it with some Earth Balance shortening, some margarine, some more raw cashews that I didn’t bother soaking (a move I kind of regretted) and I think that’s all, though I wrestled with it in all sorts of ways I may not fully remember. The final result, though, while a little bit ricotta-like (luckily I can claim that was on purpose) was delicious, quite reminiscent of whipped cream, and had the perfect amount of sweetness (ie., not too much). 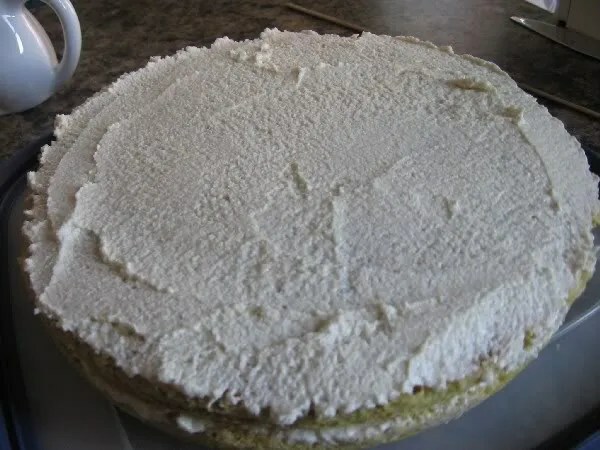 The volatility of the filling meant that the cake pretty much had to stay refrigerated, but that would have been true of a whipped cream cake, too. Side view! Happy Vegan MoFo Day 7! Caramel Pecan Bars and Dandelion Yam Soup! Vegan MoFo Day 2! So, two items (won’t be keeping up the day :: number of pics thing after today, though). 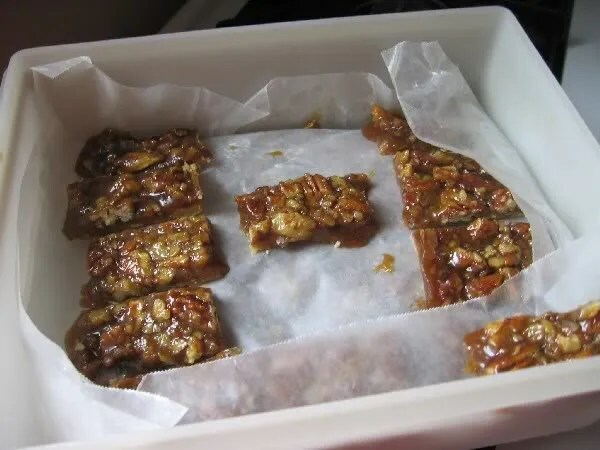 Caramel Pecan Bars from Vegan Cookies Invade Your Cookie Jar: very gooey, very addictive. 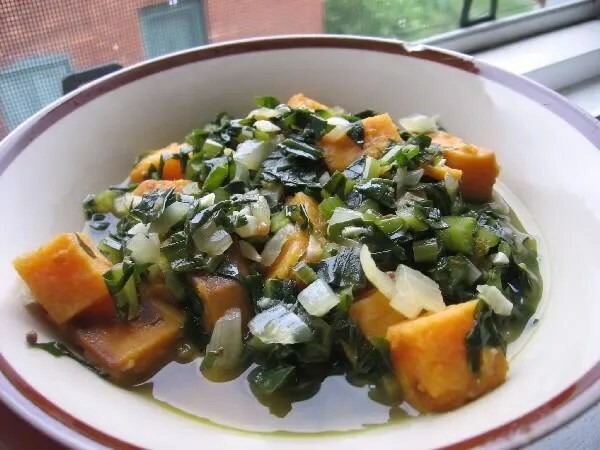 And, the dandelion and yam soup from Vegan Soul Kitchen: quite bitter because of the greens, but clean and healthy tasting in a good way. I doctored up (mostly just reduced, and added other veggies kicking around) the leftovers to serve as a pupusa filling and a pasta sauce on two other occasions!